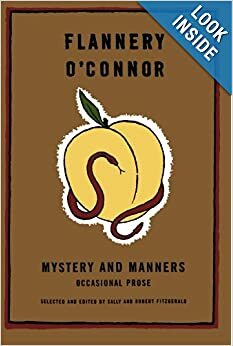 Mystery and Manners: Occasional Prose has everything that I needed to find but didn’t know I needed in a book on writing. This was not a “how to” for the aspiring writer, per se. Thankfully, however, it wasn’t a mere diatribe against “bad” or (::shudder::) “unimportant” fiction. Flannery O’Connor never gives a single handy checklist, not one pretentious evaluation of an obscure work, nor a single heartless criticism against the world of budding writers. She simply does what she says all good writers ought, which is render hard reality with a compassionate yet honest eye. Compassionate, honest rendering of reality is exactly what we should be after as writers, and to have an author bring her observant eye to bear on the very act of observation is indeed a gift–a gift to us all. Highly recommended. I think she nailed the reason why so many people do not want to read Christian fiction–or, who having read it previously, never want to encounter the stuff again. I know that’s why I tend not to enjoy most of it. The Real tends not to be present in it–not as present as it ought to be. A literature for [Catholics] alone is a contradiction in terms. You may ask, why not simply call this literature Christian? Unfortunately, the word Christian is no longer reliable. It has come to mean anyone with a golden heart. And a golden heart would be a positive interference in the writing of fiction. Hopefully I’ll be back with a few more quotes once I own an actual copy of this chunky monkey. It’s not all that often I’ll part with my hard-earned money to buy a book when I have the library at my disposal and, admittedly, now that I get so many review copies at the Catholic Marketing Network and through the evaluator program for the Catholic Writers Guild Seal of Approval. However, it looks like the estate of Miss O’Connor will shortly be making off with some of my meager earnings. OK, you’ve convinced me. I need to reread this. Haven’t touched it since grad school…1988.